The CCTV footage was recorded at a store in China. 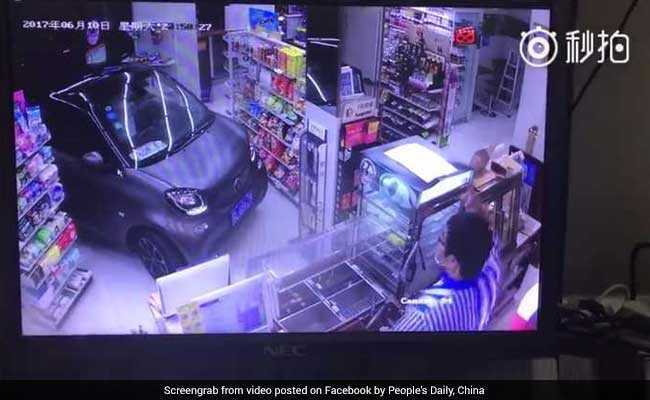 A bizarre video circulating online shows the exact moment a man drove his car into a convenience store. His reason? He simply didn't want to waste time parking his car. We're not kidding - the whole thing was captured on a CCTV camera. The video, shared on the People's Daily, China Facebook page, was recorded at a store in east China's Zhenjiang. Footage shows the car driving into the store like it's no big deal. The store worker seems visibly shocked at the car but does something even stranger. He goes up to the driver, asks him what he wants, and runs to get him a bill for his purchase. Now one might think driving a car into a store would mean a huge emergency of some kind - or at least it would help understand why someone would do something like this. However, the driver's purchase will leave you more confused. His reason for driving the car into the store was... wait for it... a bag of chips and a bottle of yogurt. Since being posted some 13 hours before writing this, the video has collected over 53,000 views. "Well, that was convenient," says one Facebook user. "I love how the clerk just completes the transaction like there is nothing strange going on," says another.